Square Eddie (pedigree) is a spectacularly consistent colt. The Canadian-bred chestnut son of Smart Strike (SRO) has been in the money six times from seven starts, from 5 to 8.5 furlongs. 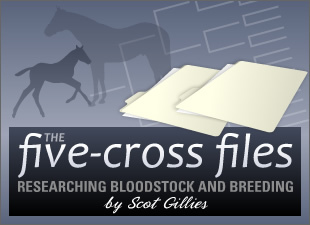 The 2008 winner of the Lane's End Breeders' Futurity (gr. I) has raced on seven different tracks and in two countries. Square Eddie has the same Native Dancer inbreeding pattern that's common to horses bred on the cross of Mr. Prospector/Northern Dancer lines. What's interesting here, though, is the duplication of Smartaire. This blue hen from American family A13 produced both Smarten and Quadratic, two useful sires of the 1980s, in addition to 1979 juvenile champion filly Smart Angle. Square Eddie is bred on the same cross of Smart Strike over Northern Dancer as Curlin (SRO), who excelled as a 3-year-old. Big Drama (pedigree) is a Florida homebred who had a legendary juvenile campaign. After placing in his first out, the Montbrook son went on a tear, racking up five wins (four of them stakes) to close the year, including the Boyd Gaming's Delta Jackpot (gr. III) at 8.5 furlongs. Big Drama has duplications of his sire's sire line and broodmare sire line -- Tom Fool and Nearctic. His dam introduces the rarely-seen Hyperborean (son of Icecapade) as her damsire, and is herself inbred to full siblings Cap and Bells and Dunce.